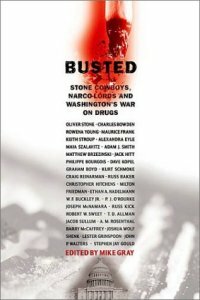 As politicians proclaim their support for an ever-escalating "War on Drugs," the first popularly written book exposing the futility of this losing war is being praised across the political spectrum. Drug Crazy: How We Got Into This Mess and How We Can Get Out, [Random House, 240 pages, $23.95; Publication date June 15, 1998] dramatically reveals the violence, corruption and chaos that characterize America's longest-running war. Author Mike Gray was a prominent journalist, screenwriter, author, producer and documentarian, whose best known work includes the film The China Syndrome, which he wrote, and the television series Star Trek: The Next Generation, for which he has served as a writer and producer. In an era when politicans vie to offer ever more draconian penalties to prove they are "tough on drugs" -- and when a marijuana conviction can result in a longer prison sentence than murder -- Gray dared to point out that our current policies are an abject failure, despite the world's highest incarceration rates and the expenditure of more than $300 billion in the last fifteen years alone. He eloquently argued for the return of a medical rather than a law enforcement model of drug control. Drug Crazy was praised in advance of publication from across the political spectrum: By two Nobel Prize winners (economist Milton Friedman and physicist Henry Kendall); by former Attorney General Elliott Richardson and former Surgeon General Joycelyn Elders; by liberal journalist Daniel Schorr and conservative journalist William F. Buckley; and by other prominent academics, scientists, public policy experts, criminologists and social commentators. The compelling similarities between today's drug scene and the Prohibition era, as seen through the windshield of a police cruiser on the same Chicago streets where today's drug gangs recreate the marketing tactics of a 26-year-old booze "kingpin" named Al Capone. The tragicomic political history of U.S. drug wars from their beginning in 1914 to the present day -- 85 years of cynical posturing and mindless bungling, manipulation of statistics, ostracism of opponents and falsification of medical and scientific data. The inevitable and rampant racism that has always pervaded the War on Drugs. The impossibility of "supply side" solutions like border interdiction or eradicating drug crops at their source, vividly demonstrated in Drug Crazy with trips to the U.S.-Mexican border and the Andean jungles of South America. The chaos clogging America's court system, where we are taken to new drug courts that run a night shift to keep up with staggering caseloads, and our overstuffed prison system, now one of the nation's fastest growing industries. The corrupting power of the "river of money" that flows from drug criminalization, which is increasinly infecting U.S. border control and law enforcement agencies. The disproportionate focus of law enforcement on marijuana (more than 600,000 arrests last year), despite its basically benign nature. Finally, Drug Crazy points toward possible solutions to the quagmire of our failed drug wars, based on the successful European model of a medically-based system of regulated narcotics prescriptions. Gray contended that the success of such programs in Britain, Holland and elsewhere have been suppressed -- and supporters of such programs methodically maligned -- by "Drug War" advocates in the United States.